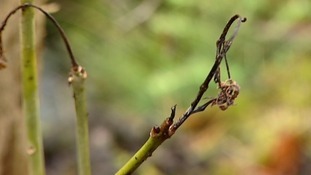 Ash Dieback has been spotted at ten sites in the Lake District. The fungal disease kills nine in every ten ash trees that it infects, and is incredibly difficult to stop. The disease has devastated ash trees throughout Europe, and it's now arrived in the Lake District. A Tree Health Officer has been employed by the Forestry Commission to tackle a deadly disease that has wiped out forests in Europe. Steve Morgan has been recording instances of Ash Dieback in the South of Scotland. Jenny Longden went to meet him. Members of the public are being asked to help a Tree Health Officer to record instances of Ash Dieback in the South of Scotland. Steve Morgan is surveying the region for the disease, which kills Ash trees. A tree health officer is being employed in the Scottish Borders to record cases of a deadly disease. Steve Morgan has been tasked with recording instances of Ash Dieback in the region. The Forestry Commission hope to use land surveys to shape policy on how to deal with the spread of the disease. It was first discovered in the UK in 2012 but Steve Morgan says it's currently unclear how widespread it is. What we are finding with the surveys so far is that there is no rhyme nor reason or logic to the disease in terms of levels of infection, how many trees are infected in a stand. We simply don't know how widespread it is yet, and how the disease is going to progress. In Europe it can hit some of the stands and really hit them quite severely. We are in a very infancy stage. We are in a research stage of finding out". Scotland's environment minister will update MSPs today on the action being taken to halt the spread of the disease threatening to destroy ash trees across the UK. Paul Wheelhouse held a summit held earlier this month to look at ways of controlling Chalara ash dieback. 14 infected sites were confirmed across Scotland including Eyemouth in the borders and Dalbeattie Town Wood in Dumfries and Galloway. "The Scottish stakeholder summit on November 13 was attended by a wide range of bodies and a number of useful and positive suggestions were put forward for further consideration." A crisis summit has been held to discuss how to combat the tree disease Ash Dieback in Scotland. Forestry groups, farming unions and landowners associations are in crisis talks in Holyrood on how to stem the spread of Ash Dieback. Representatives from forestry groups ,farming unions and landowners associations arrive at Holyrood this afternoon for crisis talks on how to stem the spread of Ash Dieback. The fungal disease, has been confirmed at 14 sites across Scotland. The meeting has been called by Scotland's Environment Minister, Paul Wheelhouse, who's also a South of Scotland MSP. Borders MSP John Lamont has accused the Scottish Government of 'dropping the ball' on Ash Dieback. “While Mr. Wheelhouse is only just starting to get into gear when it comes to fighting Ash Dieback, the UK Government has already taken quick steps to tackle it. UK plant health authorities took immediate action on discovery of the disease and they soon after imposed a ban on ash imports and restricted its movement. The Scottish Government says it is not realistic to completely eradicate the disease, which has spread across the UK. Mr Wheelhouse says work will get underway to identify trees that have a genetic resistance to the fungus and can be used to restock woodlands.